In a terrible scene in Arizona Representative Gabrielle Gifford and others were shot as she held a meeting with her constituents outside a supermarket. At least six are dead. My prayers are with everyone involved in this, their families and loved ones. Even as at least one of the suspected perpetrators has been identified and theories on motive swirl and the unfortunate game of politics is already playing out, the major attention has been on how Rep. Giffords is doing. Rep. Giffords suffered, per reports, a single gunshot wound to the head with both an entrance and an exit. From eye witness accounts with a posterior entrance wound. In the same press conference it is commented that the bullet transversed just one hemisphere. She underwent neurosurgery, although the exact nature of such isn’t clear. Post operatively she was following commands. Of course, no one but her physicians right now know exactly what is going on but missile wounds to the brain are tough things. There is some optimism but I’m afraid we should probably be more cautious than some of the vibes coming from the media. The fact is, in the best of circumstances, missile wounds to the brain and, in particular, gunshot wounds to the head are bad things. That’s no surprise but I think that when we talk about prognosis and the optimism that seems to have overtaken the media from the report of Dr. Rhea is probably more about Rep. Gifford’s chances for survival, perhaps for a functional recovery although it is far too early to talk about that in detail. It may not be about her ever being the same again. “I don’t want to be pessimistic about a person I don’t know or haven’t examined, but just being scientific about it, I think the accurate thing to say is that this is a grievous injury and the outcome will not be known until 6 to 18 months after her injury,” he said. 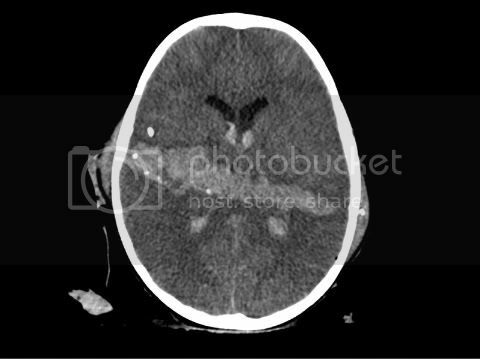 Relatively low velocity gunshot wounds to the head, as inflicted by handguns, cause direct damage along a relatively limited area immediately along the tract of the bullet. This can be bad enough, depending on where the bullet travels through the brain. However they also produce hemorrhage inside the skull which can sometimes put further pressure on the brain. And the damage caused by the bullet causes swelling of the brain. The swelling and the bleeding cause maybe the biggest problems. The skull is a closed box, adding bleeding into it or swelling raises the pressure inside of it. Imagine putting more and more air into a balloon until it ruptures because the air has nowhere else to go and the balloon can’t contain the pressure anymore. As the swelling inside the skull raises the pressure the brain gets damaged and gets forced out of the skull with very dire consequences. Probably somewhat surprisingly the indications for surgery in gunshots to the head are somewhat amorphous. Certainly in the case of bed swelling within the skull removing part of the skull to relieve some of the pressure can be considered. In the case of a bad hemorrhage putting pressure on the brain surgery can be done to remove the blood and stop any active bleeding. Possible elevation or removal of broken bone fragments which have been pushed into the brain, especially if large pieces are superficial and easily accessible in surgery. Closure and reseparation of sinuses broken through by the bullet from the intracranial area. The details on the surgery Rep. Griffords underwent aren’t available but any of the above could’ve prompted her surgery. There’s a possibility she required part of her bone to be left off after the surgery. There’s a strong possibility she has a device in place, inside her brain to monitor the pressure level. There’s a strong possibility she’s still intubated (on a ventilator to help her breathe). Her prognosis is a very difficult thing to judge right now. There are certainly at least a couple of things that I’ve heard that are promising. The fact the bullet only went through one side of her brain is good. The fact that immediately post operatively she was following commands is also good. People who have bullets travel through both sides of their brains generally have worse outcomes. As do people who have bullets travel through one or more of their ventricles (the areas in the middle of your brain where spinal fluid is made). As do people with significant bleeding. As do people who have a poor neurological exam on arrival to the hospital (things like not following commands or not moving). Those laid out, we think we know that the bullet did not cross the midline and, that being the case, may have spared her ventricles. As well we know she was following commands, implying a relatively good neurological exam considering her injury. But all that said, the fact she required surgery and just the nature of gunshot wounds in general means we should continue to be extremely cautious and to continue our prayers for Rep. Griffords. If she survives this injury it will be a long while before we know her full prognosis, just how much she will be like herself before the injury. My prayers are with her, her family and all of those who suffered today. You can read more on penetrating head injuries here and on the prognosis for those suffering such here and here. Hi there to every , because I am genuinely keen of reading this web site’s post to be updated daily.